Looking for a way to guide visitors through your property and showcase your favorite design elements? A walkway can help you accomplish all your goals—and flagstone is a great choice! The material offers a natural beauty that will blend in with the surrounding landscape and complete the look of your home. So if you’re looking to add a touch of elegance and make your landscape design more functional with a flagstone walkway in Northern Virginia, let us help. Call us at 703-533-5001 to schedule a consultation today and we’ll customize the design to meet all your needs and more! Attractive look. Flagstone walkways offer a unique, natural look. Stones typically come in varying shapes and sizes—even colors—and come together to create a distinct design and random, irregular pattern. Durability. Since walkways need to withstand foot traffic and extreme weather at times, it’s important to choose a material that can handle regular use. Flagstone is resistant to freezing and does not react to hot temperatures, humidity, or snow. Low maintenance. Flagstone is considered a low-maintenance paver that only needs occasional sweeping to remove dirt. At O’Grady’s Landscape, we design and build flagstone walkways for homeowners in North Arlington, Great Falls, Vienna, the City of Falls Church, and McLean based on the individual needs and wants of each client. We begin the process with a discussion to learn your goals and ideas, as well as a walk-through of the property to determine the scope of your landscape and get a feel for how a new walkway could impact drainage. Then, our landscapers typically create a written design with our plans and continue with construction to match your home exterior and create a more functional outdoor living space. The design process, however, is customized based on your specifications for style and budget, among other things. For a better idea of flagstone walkway projects we’ve created throughout Northern Virginia, view our patio and walkway photo gallery. Are you ready to create the charming home entrance you’ve always wanted, with an elegant, yet natural, flagstone walkway? 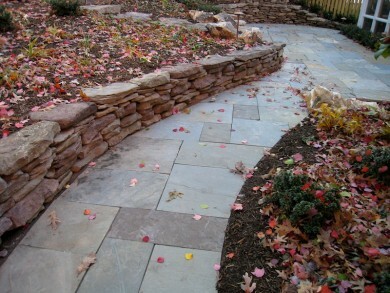 Or build a flagstone patio with the perfect walkway to complete the design? Whatever your hardscaping needs may be, the professionals at O’Grady’s Landscape are here to help make your dreams a reality. Let us create an outdoor space that reflects your sense of style and leaves an impression on all your guests. Call us at 703-533-5001 to schedule a consultation for a flagstone walkway in North Arlington, Great Falls, the City of Falls Church, Vienna, or McLean!